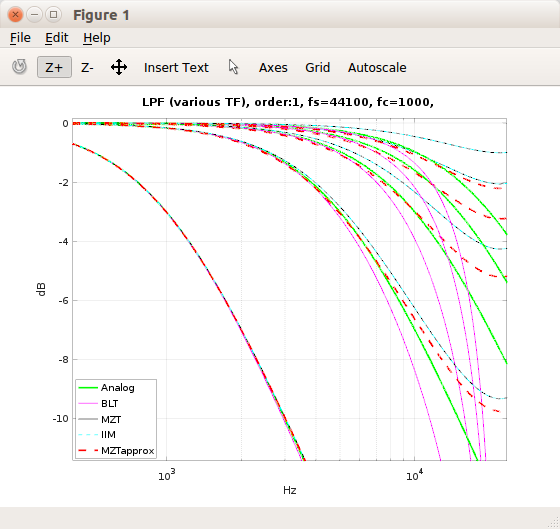 FYI, not long ago I got an idea of trying to speed up MZT/IIM based one pole LPF by using Taylor series to approximate exp() function. After some tryouts I found out that use of just degree 2 polynomial resulted approximation error which actually improved the resposne of the MZT/IIM filters when cut-off frequency was approaching Nyqvist. Not perfect filter but better ... and probably can be improved more but my math skills are not that good... . I also did run speed comparison against the original exp() based filter implementation and got about 20x speed up with this tweak (Ubuntu, g++, --ffast-math enabled). This is cool, I'll check it out when I have My computer. Thanks. Is it possible to design filters in matlab and get code that works in FS DSP/assembler? lalalandsynth wrote: Is it possible to design filters in matlab and get code that works in FS DSP/assembler? Nope, if you plan to use Matlab build in functions for to design the filters. IIRC, Matlab can export to c/c++ but my quess is that most Matlab related functions/code uses header and library files by Mathworks (licencing). Compiler explorer probably could help in bringing the C -code to FS Assembler ... haven't checked it but, here's an example based on my post above.